Apple iPad Air 2, iPad Mini 3 now up for pre-order online at Rs 35,900, Rs 28,900 respectively, will be released by November end. 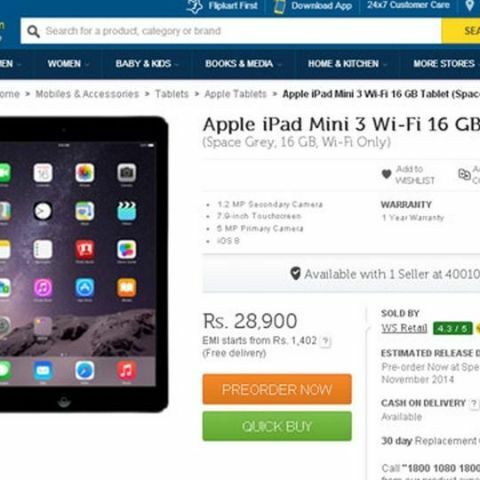 Apple's new iPad Air 2 and iPad Mini 3 are now available for pre-order on ecommerce websites such as Flipkart and Snapdeal with price starting at Rs 35,900 and Rs 28,900 respectively. The devices are listed as coming soon with a release date of November end. The Apple iPad Air 2 has a 9.7 inch display and is powered by an A8X processor. The iPad Air 2 is one of the thinnest devices by Apple and is 18 per cent thinner than the original iPad Air. It measures just 6.1mm thin and weighs 435g. The Air 2 comes with a TouchID fingerprint scanner for additional security. It has an 8 MP iSight camera with panorama view possible up to 43 MP with option of Burst Mode as well as a 1.3 MP front camera. The Apple iPad Air 2 16GB WiFi model is priced at Rs 35,900 and the Apple iPad Air 2 Wi-Fi 64GB and 128GB variants are available at the price of Rs 42,900 and Rs 49,900 respectively. The Apple iPad Mini 3 has a 7.9 inch display and comes with TouchID button. It has an Apple A7 SoC and runs iOS 8.1. It has a 5 MP iSight camera and a 1.2 MP secondary camera. The Apple iPad mini 3 (Wi-Fi + Cellular) model 16GB, 64GB and 128GB variants are available priced at Rs 38,900, Rs 45,900 and Rs 52,900 respectively. Apple iPad Air 2 and iPad Mini 3 are available in space grey, white and gold options. Both the devices were unveiled in October and were expected to be released in India along with the Apple iPhone 6. However, they have been released just after a month of their launch, which is not bad given Apple’s track record in India. Apple ipad 2 USB charger price in market ?